Too often I've found myself the victim of this cliché, more often than not because of people outside the original handshake. I have a tendency to trust people's intentions, and am willing to work with people in good faith until that trust is broken. When dealing with an individual, and not a business, this can be an appropriate relationship. However, when dealing with business this will often get you in trouble (not only because of the legal considerations). The reason is that very rarely are deals handled by only two individuals. Without something in writing, you are guaranteeing pain and wasted time which could have been avoided if the deal was written down in the first place. I was approached about contracting one of my employees to a project outside the Continental United States. I crafted a proposal letter covering what I considered the basics for a contract employee (per diem, vacation window, work conditions, expenses, rates, etc.) which the client representative (who would be the project director) agreed to verbally. The client's company provided a Master Service Agreement (MSA) which only provided a minimum of these items, however we signed it with the understanding that the client would issue a Purchase Order (PO) reflecting the proposal letter. Several weeks later, the clients legal department decided the MSA was sufficient and that a PO wouldn't be necessary. I discussed with our client representative, confirming that the client would live up to the proposal letter, and my employee started work. The difficulty occurred with our first invoice issued. A cost controller received the invoice, noted the billings didn't match the MSA and refused payment, causing a 2 week discussion while we worked with the Project Director to confirm the details of the invoice. I asked for a PO update, and was told it wouldn't happen again. I assumed that his agreement would be sufficient, and he would inform his project team of the agreement. The next month, another invoice, and another prolonged conversation because I didn't get the agreement in writing. After the second time, I informed the Project Director that this wouldn't be acceptable and that a PO would be required in order to ensure the continued presence of my employee. We have since received the PO, we no longer have extended invoice windows, and there is no additional time wasted on repetitive conversations. 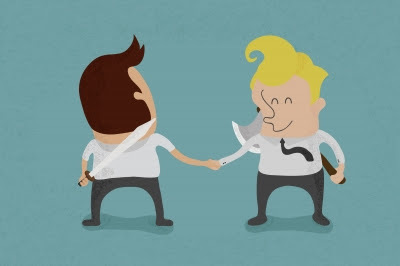 The person you made an agreement with leaves the organization, so now you have a new person to negotiate with. That person doesn't know anything about previous arrangements and has his / her own ideas on what is appropriate. The person you made an agreement with changes his mind. He / she decides that he / she can gain an advantage and negates the deal originally agreed. The person you made an agreement with is not the final decision maker, and that person has other ideas, and doesn't care about agreements made with other people who didn't have authority. Making agreements via handshake can be significantly difficult to support in a legal sense. There may not be any proof that the agreement exists, then it is your word vs. his / hers. As a Leader / Project Manager, any agreement made should be placed in writing and signed by the appropriate parties. Without the signed agreement, all you are doing is guaranteeing extended difficulties for yourself and project team. It may seem, to the people you hold to this standard, that you don't trust them. In reality, it isn't about trust, it is about ensuring that things are properly taken care of and removing future obstacles to completing your job.